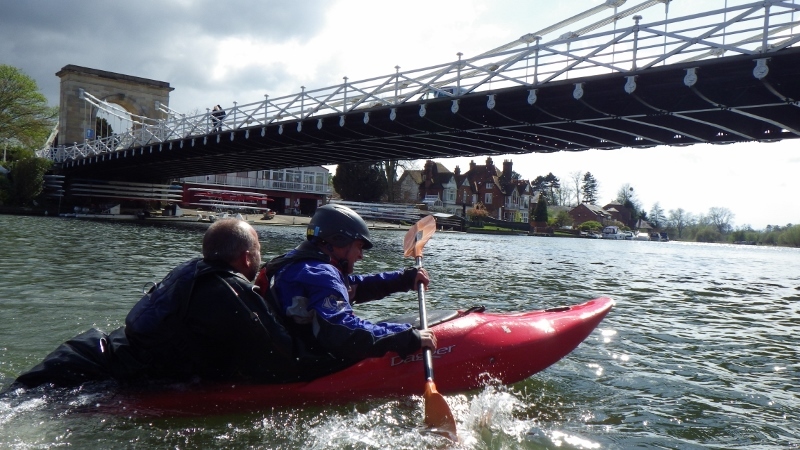 Ran my first FSRT course of the season yesterday – yes, the Thames is warming up! – and had the first chance to include new thinking on deep water rescues. For years we’ve taught that the start point for most rescues is, having secured the safety of yourself, group and victim, to have the boat to be rescued upside down. At last year’s Canoe England Coaching Conference Dave Rossiter was advocating that the first thing to do is to roll the boat in the water so it’s the right way up. Apart from anything else once you’ve done this your options for taking hold of the boat are greatly increased! With a kayak the right way up and bow pointing in the same direction as your bow, the next stage is to sink the gunnel closest to you, put the boat on edge and then sink the (air bagged) stern. As water drains from the rising bow end a judicious push away on the stern and swivel allows you to drop the boat upside down across your cockpit/front deck complete the drain and land the boat right way up on the opposite side ready for your victim to climb back, either over the stern of their boat or preferably over the front of yours. Working through this with yesterday’s trainees confirmed the efficacy of this approach. With open canoe rescues this approach works even better. Starting with the swamped canoe right way up and at right angles or thereabouts to your boat it is possible to roll the boat in the water so the bow (or stern) plate of the boat being rescued drops onto your gunnel. You may need to edge your boat to achieve this, but once the boat is your gunnel it’s then just a case of feeding the upturned hull across your boat in the usual way. Taking this approach to rescuing canoes and kayaks means no more struggling to break an air lock or heavy lifting! Interesting, we do something similar with Kayaks, instead or righting them we endeavour to curl them from the side, it is not about strength it is about technique. I have just been signed off as an FSRT provider and will have a practice with this and see how it goes. I’m sure I’ve seen you demonstrate this at the club some years back. The only other person that might have demoed it would have been Rob Yates whilst I did my L2K training, but I’m pretty sure it was at MCC. Thanks to all for the feedback. Like so much in life and paddlesport there is an element of variation on an old theme here. Starting the rescue with the capsized boat right way up in the water and not struggling to break an airlock when lifting from the end is perhaps the key point.